A private collector of religious art wanted an exhibition building that would sit well with the client’s own house already on site. Hence the choice of a building rooted in the principles of the ‘Bossche School’ and Dom Hans van der Laan’s system of architectural proportions. It consists of a broad main space for exhibitions and a narrow strip with a stair and service areas. The main zone is daylit through slits of fenestration high up in the space. 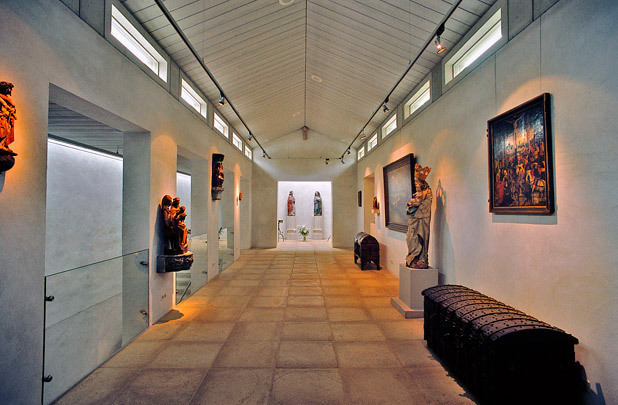 At the end is a chapel containing two outstanding exhibits. The basement is reached by a concrete stair. This and the rendered walls, cut stone floors and zinc roofs exemplify the choice of unobtrusive yet sturdy materials.